"Your mission, should you decide to accept it... "
Mission: Impossible - Operation Surma is the latest "stealth" third person shooter from Atari that puts gamer in the role of Ethan Hunt, an operative for the legendary IMF Agency. Once again Ethan and his operatives must traverse the globe (from Europe to America) and prevent the world from being terrorised by insidious terrorist factions. Joined by Luther Stickell, your computer expert, Billy Baird, your transporter, Kelvin, your personal fast talker and Curry, a rookie IMF agent, you must learn to work with your team because going alone is really a mission impossible. 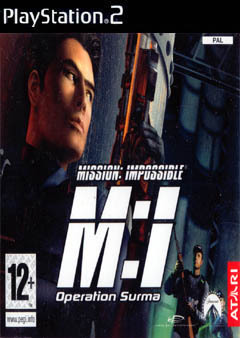 Mission Impossible - Operation Surma (MI) is a cross between two block buster games, that of Tom Clancy's Splinter and of Konami's Metal Gear Solid 2. 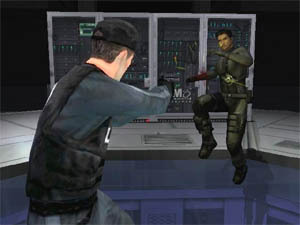 As with both of these games and with the current title, the player must ensure that he is rarely seen by the enemy and use whatever means possible to ensure this. From hand-to-hand combat to deadly military style weapons, Ethan Hunt is the perfect agent whose middle name is stealth. 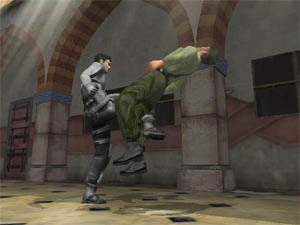 The main theme behind MI is stealth and the player must use his own guile and wit to perform a variety of stealth based missions. Fortunately for Ethan Hunt, he has access to a variety of technological advanced gadgets that gives him the edge against his deadly opponents. From stock standard items that include night vision goggles and tranquiliser pistols to more advanced futuristic gadgets like sonic imagers and the multipurpose EWG, Hunt may have the advantage but if the wrong person discovers his presence, the mission and maybe his life is over. My favourite gadget in the entire game is the electronic warfare gun (EWG) that allows you to perform a variety of tactics such as disarming security cameras and even creating false sound decoys. As with all stealth games, you cannot just blast your way through the missions like a Hollywood action star but rather, you must ensure that no one discovers your presence by using the environment to your advantage such as the shadows and various hiding places. The player is also guided by a HUD throughout the gaming world that allows you to access your gadgets, displays a map of the current area and also mission objectives. You can even use your EWG to tag enemies in the game and once they have been tagged, they appear on your map to ensure that too many surprises don't happen. The combat of MI is brilliant and although not as in-depth as a stand alone fighting game such as Tekken of Soul Calibur, I was quite surprised at what Ethan Hunt can perform from a variety of different punches, kicks and even blocks. Although the view for hand-to-hand combat is from a third person view, the view changes to a more familiar first person view when you are skulking around with your hand gun that not only makes things easier to shoot but also increases the realism of the game. 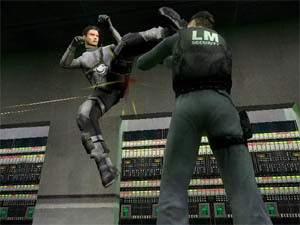 Apart from the realistic combat in the game, you must also avoid a variety of obstacles in the gaming environment such as security cameras, alarms, guards and as with Splinter Cell, if an alarm is tripped, you can sometimes disable them before the mission is prematurely ended. I'm not sure if this is a bug in the game but once the alarm is cancelled, the guards unfortunately go back to their regular routine and sometimes completely forget that you even existed. As with the majority of console games (a pet peeve of mine), there is no save anywhere feature in the game. The game automatically saves at the start of each level but fortunately there are a few checkpoints littered throughout the levels to ensure that you don't always start back from the beginning of the level. Although most of the missions are relatively straightforward, there are a few missions that were extremely frustrating and the only way to solve them was by either trial and error or by pure luck. Graphically, MI is a very impressive and sturdy looking game that uses a variety of lighting effects to help portray the stealth aspect of the game. The character models are extremely detailed and realistic, especially the main character Ethan Hunt. Apart from the impressive looking characters, the backgrounds are a pure treat and the developers have done a great job at recreating the different locations that you visit. Although no real special effects in the game (besides the night vision view and lasers), the shadows and lighting are probably the two things that really set this game apart from the other titles in this genre. The musical score of MI is straight out of Hollywood and really helps set the atmosphere of this strategic title. The game also contains a variety of sound effects from hand-to-hand, gun battles and of course the noises of alarms, security cameras and futuristic gadgetry. The voice acting of the game has been professionally done and each voice suits the character perfectly, whether it's Ethan Hunt or Curry. Actor Ving Rhames also lends his voice Luther Stickell who he also played in the movie with that rough and deep voice. In conclusion, Mission: Impossible - Operation Surma is a very addictive and entertaining title that is the perfect game to keep you busy until Splinter Cell 2 is finally released. With a very sturdy game interface, absolute stunning graphics and a musical score that is worth an Oscar, Mission: Impossible - Operation Surma may be the title for you! "This mission will self destruct in five seconds!"